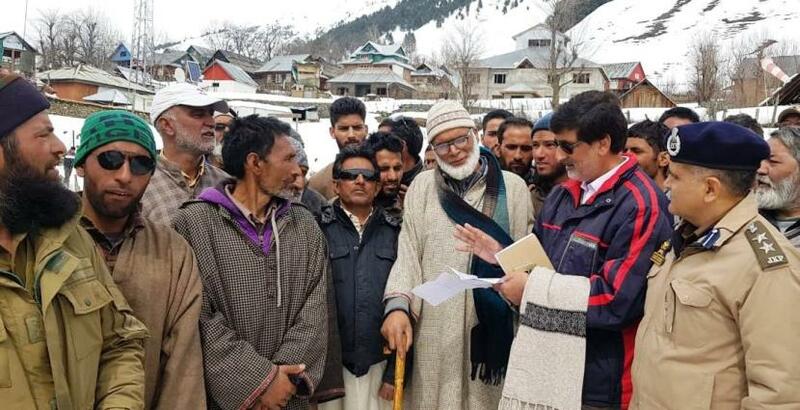 KISHTWAR: To redress the grievances of public at their door steps, District Development Commissioner, Angrez Singh Rana, today visited far flung snow bound area of Warwan. The DDC was accompanied by SSP, Shakti Kumar Pathak , while scores of locals met them during the tour. The locals projected various demands including restoration of BSNL tower, release of pending wages of Job card holders since 2017, dev elopement of infrastructure for basic facilities, furniture etc. for smooth functioning of High School Inshan, speedy snow clearance of local/link roads including Inshan to Afti, Inshan to Choidraman, Inshan to Basmina, Inshan to Margan top- Matigrawan, construction of Tunnel from Hapatnar Warwan to Shangus Anantnag , Concession in Air fares of Chopper services from Kishtwar to Warwan, posting of doctors at PHC Warwan and Allopathic dispensaries. The DDC issued on spot directions to the concerned departments to look into all these issues for an early redressal. He directed concerned authorities to immediately restore communication and link roads in the area. Direction were also passed to concerned officer to clear the pending wage claims/liabilities of Job card holders for the year 2017. Further, DDC directed BDO to release all pending payments under SBM and also complete the geotagging process. Responding to the demand raised by the local with regard to non-availability of doctors at Basmeena, Margi, Sukhnai, Warwan, the DDC assured the people that their genuine demand shall be taken up with higher authorities for speedy redressal.